Register now by clicking the Orange button above. If you prefer to pay at the class instead, send an email to: SchoolOfLaughs@gmail.com and put “READY FOR THE APRIL WRITING CLASS – SEND ME THE DEETS” in the subject line. Register now … Don’t be left out. We will watch comics on Letterman and break down why they make certain choices. We write jokes and have an opportunity to share in class. We don’t get onstage, however (we save that for the Performance class in May). So it’s a pressure-free environment where you can speak up as much – or as little – as you like. As an added bonus, this writing comedy class comes with a “Lifetime Warranty” based on available space. Once you’ve paid for the class, you can attend any and all following writing class sessions at no extra charge. So you can apply the knowledge as you progress through the ranks of comedy to make it a custom fit every time! 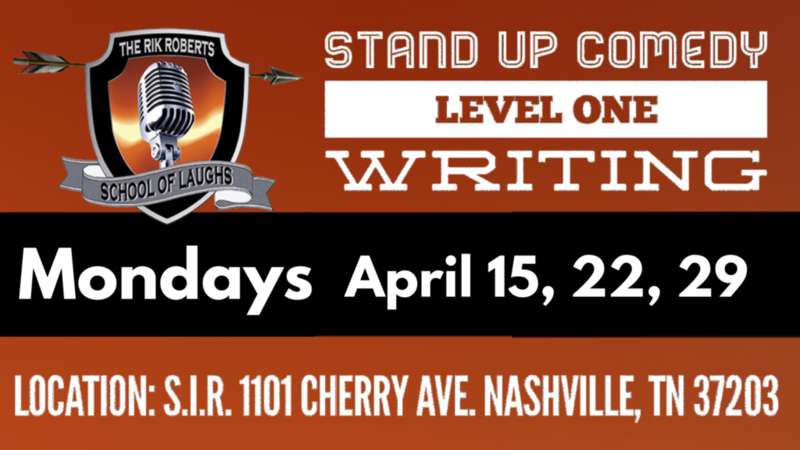 You may still register and claim your spot by sending an email to SchoolOfLaughs@gmail.com and put ““READY FOR THE APRIL WRITING CLASS – SEND ME THE DEETS” in the subject heading. I will save a seat for you and you can pay the class fee of $200 at the first class session.